Identifying Strains in Marijuana Startups: Which Weed Business is Right for You? Marijuana is bigger business than ever, and everyone's getting in on the action. Peer through the smoke for a snapshot of the pot business in its current state of like, totally selling out, man. A little over a year ago, I shared my keen insights and vapor-fueled predictions on the future of marijuana startups right here on this very website. Since then, the industry’s been growing like a we…ll tended and properly cared for horticultural specimen, and I thought we should check in. To see what magical mystery tours 2016 witnessed in the world of weed, and to see which end of the joint is sparking in 2017. It’s high time for an update, in other words. And here those other words are. I was less than impressed with all of the “Uber for Weed” apps sprouting up in 2015, and I’m no more fond of them today. Maybe even less so. Companies like Meadow, GrasspIt, Canary, and FlowKana struggle to find a unique angle or innovation, and though the basic business model is fine—users go to the app, pick one of the independent weed sellers in the area, make a purchase, and get their weed delivered—there isn’t a lot of there there. All of the apps (that I’ve found) are specific to certain regions or cities, and none of them operate across state lines, and they’re competing with delivery services offered by many dispensaries/recreational sellers where weed is legal. They all operate in essentially the same way, which is exactly how customers want them to operate. I buy weed; you bring weed—there isn’t a whole lot of room for disruption or process improvement. At the end of the day, it’s volume that’s going to make or break a marijuana delivery business. Whoever has the most customers and suppliers, and the largest network of drivers (to provide the fastest service), is going to win. As others have pointed out, legalization is actually a threat to many marijuana-specific businesses for this very reason: once Postmates feels confident offering weed delivery along with their current restaurant and retail delivery services, you’d better believe they’ll try for their cut of the green. When they do, they’ll bring the efficiencies of a large operation and economies of scale, and they’ll be able to roll out to new cities and regions as fast as they can find suppliers. 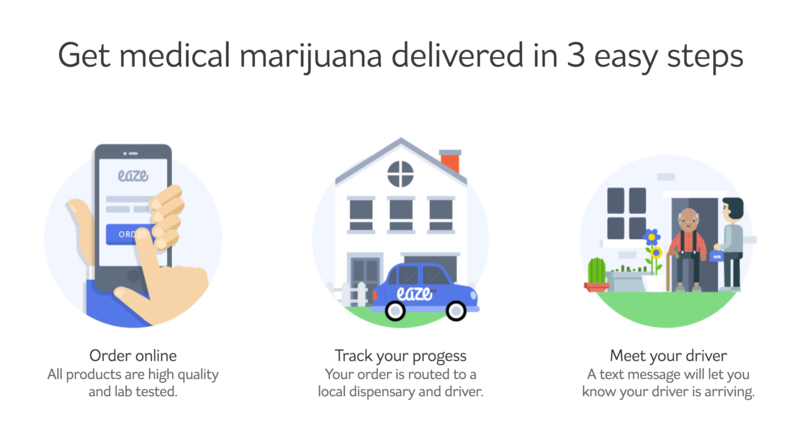 Eaze, which is available in several metro areas in California and which also offers online medicinal approval (which won’t be too meaningful when CA’s recreational laws go into effect), is poised to be the front-runner of the weed delivery niche. Can they hang on through a decade of legalization and increased competition with relatively little innovation or differentiation? Perhaps. No question that some weed delivery businesses will survive. But whoever it is will operate exactly as expected, so I’m not exactly fiending to find out. Who needs delivery when you can spend three months cultivating your own substandard product? Grow-at-home solutions have been blossoming lately, too, and this is a bandwagon I’m a little more liable to join. A very little. I like the idea of growing my own pot (or my hydroponic vegetables and culinary herbs, which every company in this niche emphasizes in their marketing). It beats sitting in a parking lot for twenty minutes waiting for a guy to drop a baggie in my window, or wondering if the feds will intercept the package I ordered. I also know, though, that growing good weed is a lot harder than stoner comedies make it seem, and I’m skeptical of any app that promises it can make all the right growing choices for me. Still, the apps are out there, in many cases along with the hardware you need to start growing. 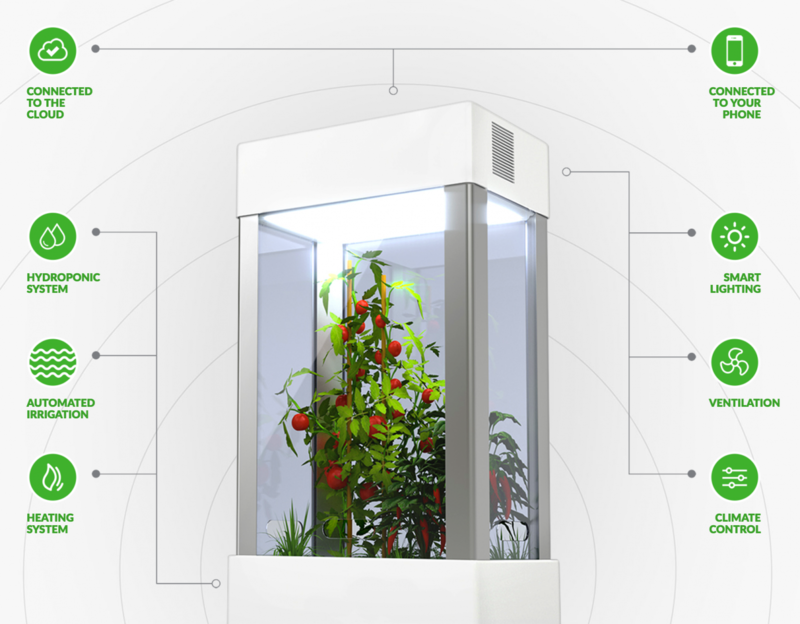 Grobo and Leaf are two popular startups in this niche, each offering their own self-contained growbox that controls light, moisture, and more, all automated or manually adjustable (and monitorable) via a dedicated app. Niwa promises the same at a fraction of the price, and since none of them can actually be purchased yet—though pre-orders are available from all companies, and Grobo has had one successful round of sales on a limited manufacturing run—it’s the one I’d be most likely to gamble on as a cannabis enthusiast and DIYer. As far as companies go, though…these growboxes are more likely to catch on where pot is illegal and hard to obtain. For almost everyone else, they require more up-front capital and more hassle than they’re worth. Weed hobbyists will get a kick out of it, just like homebrewers, but everyone else will get their weed like they get their beer. By buying it, not making it themselves. The concept of the ambitious and motivated stoner is so paradoxical that even writing this sentence was hard. Like weed delivery, volume makes the cost of weed production go way down, on a per-unit basis. When we have a company making vertical weed forests, I’ll invest. Until then, I’ll be making my contributions to marijuana growing startups one ounce at a time. At the risk of repeating myself a year down the line, the real opportunities for disruption, innovation, and industry upheaval aren’t on the consumer side of the weed business. They’re on the supply side, where existing growers and sellers have been running like the clandestine mom-and-pop shops they are. Legalization makes resource investment less risky, and that means there’s room for Big Data and other corporate trappings to start improving bud’s bottom line. 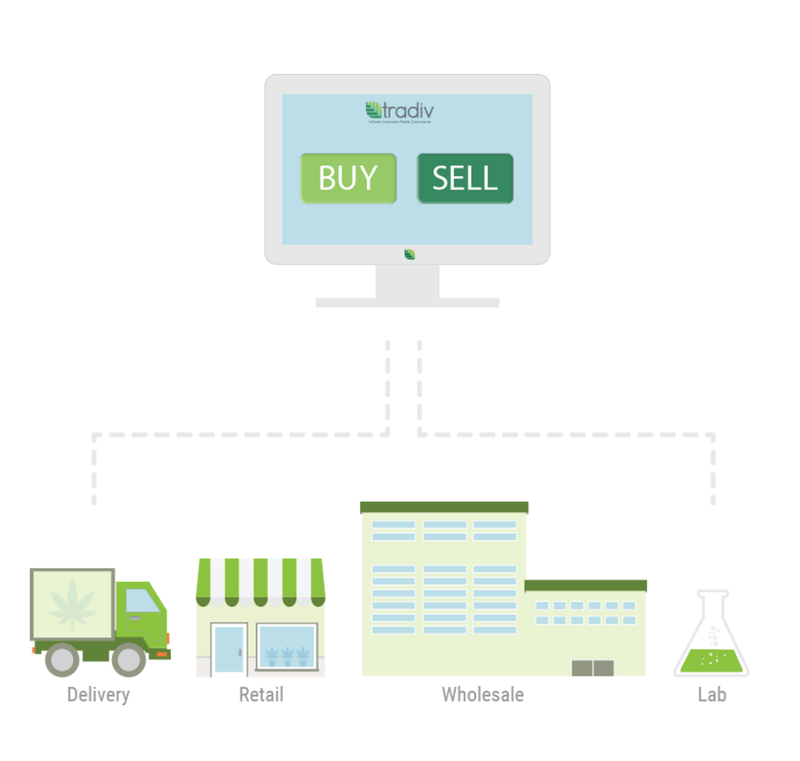 Tradiv, a Colorado-wide online marketplace for cultivators, processors, and sellers/distributors makes its green by helping other marijuana businesses thrive. Like any other similar platform, they get a cut of the business that passes through their hands while providing some quality control/recourse, smoothing out supply chain hiccups, and creating a meritocracy that separates the wheat from the chaff…or the weed from the ash, if you will. PreciseCannabis is a marketing/PR firm with a crystal clear focus. They’re making the most of the modern age and relaxing marijuana laws to bring mary jane to the masses, and they aren’t just blowing smoke—they’ve garnered a few accolades along the way. And then there’s WeedTraQR out of Seattle, which offers growers and sellers full compliance with WA’s detailed and intense tracking laws. “From seed to sale,” as they put it, WeedTraQR helps farmers and shops keep an eye on their crops, automating many of the reports required by the state and offering at-a-glance tracking and assessments when needed. These are just a few of the new businesses growing up around the weed delivery services and newfangled grow ops. They’re a sign of the maturing marijuana industry, an industry that’s ready to leave behind its image of adolescent slackerdom and free-spiritedness. One that’s ready to get down to the business of making money by getting people inebriated more efficiently, more copiously, more constantly. It’s the goddamn American Dream, and Christ knows we need something to look forward to right now. Grow boxes are going to be huge. Especially with a companion application. Even though some businesses are struggling to find that angle, I think they will in the next 5 to 10 years. There is a lot of growth potential here. The business is booming in the states that make it legal. There is nothing wrong with that at all. It has created jobs and businesses all over the place. SO many businesses coming out of the legalization of weed. I am happy to see it. Hey Daniel, thanks for the shout-out to Grobo! We fully agree that growing cannabis (or almost any plant) is REALLY hard to do which is why we are constantly growing as many plants as possible and after two years we’re getting pretty good at it. I know you’re betting on NIWA, however I have to point out that they launched a Kickstarter three years ago and still have not shipped yet. Our first Grobo Ones will ship this spring and even though they cost more than NIWA I think you will quickly see that the grows will speak for themselves! Here’s one more great company published article about apps like Postmates – https://www.cleveroad.com/blog/how-much-does-it-cost-to-make-an-app-like-postmates- You should check it!